Sequential mode – Media is moved by the library as the backup spans from one to the next. The library must be set to "sequential mode," and the UltraBac Media Library Controls will not be usable. 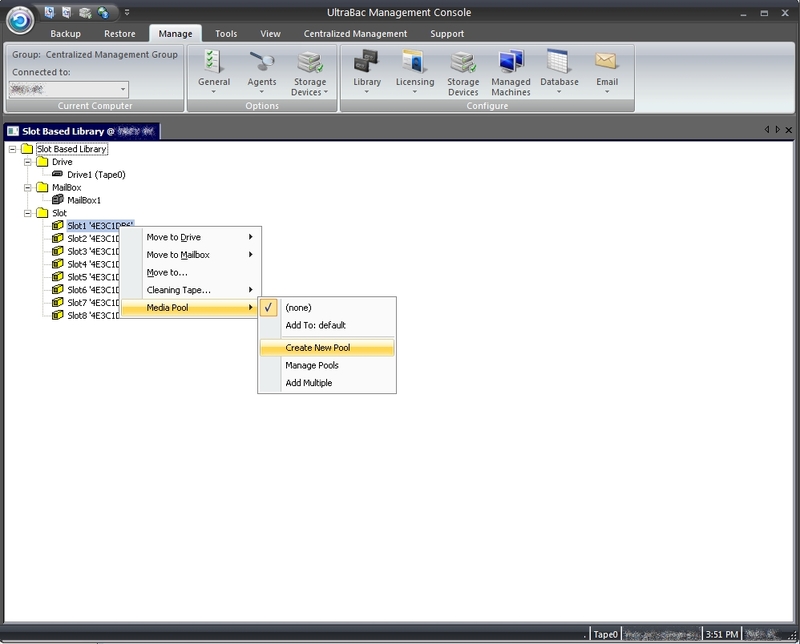 Slot based backups – A slot range is specified for use in each scheduled group. The media library must be set to "random mode," and the UltraBac Medium Changer device driver must be loaded. Media pools – A pool of media is created in UltraBac and specified for use in each scheduled group. The media library must have barcode support, and the UltraBac Medium Changer device driver must be loaded. To use the UltraBac Media Library Module, the UltraBac Medium Changer device driver must be installed on the system hosting the autoloader. Expand the "Medium Changers" component appearing on the right side of the screen. Select "Display a list of the known drivers for this device so that I can choose a specific driver" and click "Next." Browse to the location of the "mchgr.inf" file (by default in "C:\Program Files\UltraBac Software\UltraBac\Drivers\Win2k"), and click "Open." At the "Select a Device Driver" screen, highlight the "UltraBac Medium Changer Device"and click "Next." Click "Yes," then click "Next" again. NOTE: The UltraBac Medium Changer device driver must be updated to the newest driver even on systems already running UltraBac and just upgrading to version 9.3. The old driver will no longer work for remote backups nor work on Windows Server 2012 servers. The Library Configuration tool can be used to map the drive layout of the libraries attached to a backup host. Fig. 1 - Library Configuration tool. Select the Manage tab, Configure box, and click "Library"/"Configure Library." Click "Begin" to run the configuration process. Click "OK" when the configuration is complete. Select the Manage tab. In the Configure box on the menu bar click "Storage Devices"/"Tape." Click on the autoloader's tape device to select the device. Then, access the media library. Select the Manage tab and click "Library"/"Control Library" or press the keyboard shortcut F9. 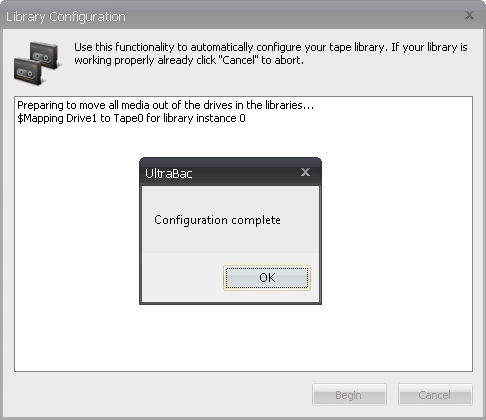 The Library Control selection is only available if the tape device is selected as the current storage device. Fig. 2 - Media library controls. From the above screen, drag and drop tapes into the Drive, Mailbox, or Slot, or right click on an object and move the tape to its destination by choosing a Slot, Mailbox, or Drive number. Move to Slot – Move the media from the selected element to the specified available slot. 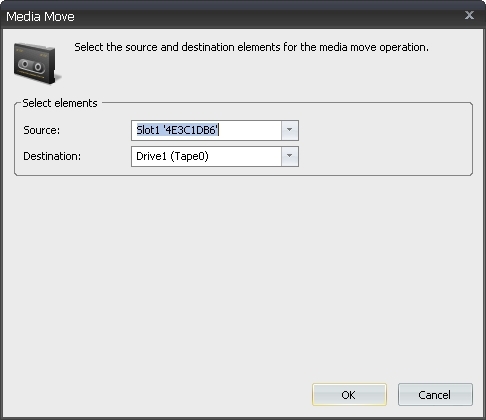 Move to Drive – Move the media from the selected element to the specified available drive. Move to Mailbox – Move the media from the selected element to the specified available mailbox. This option is only available on libraries that have mailbox slots. Move to... – Opens a control screen allowing the selection of the source and destination elements/locations. Fig. 3 - Media Move options. 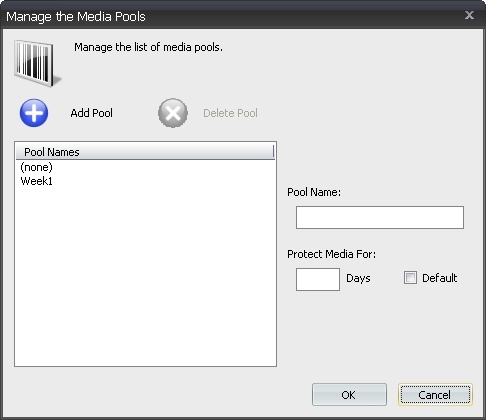 Media Pool – This option allows media to be added to any available media pools, create new pools, or to manage existing pools. To control a remote library, UltraBac must be installed on the remote server and the UltraBac Medium Changer device driver must be installed on the system hosting the library. To manually manipulate media in the remote library, use the “Connect” feature to control the library host system, and use the control methods above. To use a remote media library for a scheduled backup, create a "Remote" device, select the device as the default, and set the "Remote" device as the first backup storage device under "Use devices in this order." Media pooling has been implemented to allow better organization and automation of library backups, as compared to "slot based" backups, or using a media library in "sequential mode." Some benefits of using media pools include space savings on tape, automatic inventory of bar codes, lower-level administration, and more in-depth logging information. To use media pools, the tape library must have barcode support, and only media that has a readable barcode can be used. Right click on a tape with a barcode listed. Click "Media Pool"/"Create New Pool"
In the Media pool name field, type a <name> for the Media Pool. Fig. 4 - Media Pools in the Autoloader Library controls. (none) – Remove the specified barcode from the media pool. Fig. 5 - Media pool options. Add to: default – Adds the selected media to the default media pool. 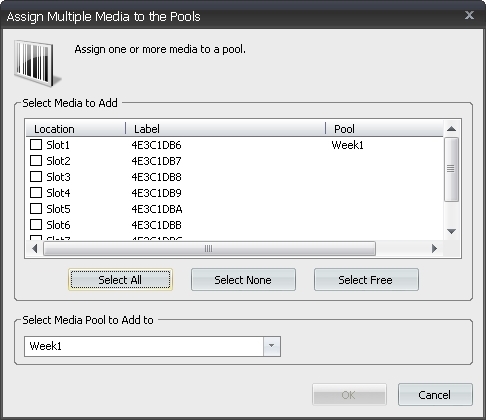 Create New Pool – Opens a dialog that allows a new media pool name to be specified. Fig. 6 - Specifying the media pool name and management. Manage Pools – Opens the "Media Pools" maintenance screen. Add Multiple – Opens a screen that allows multiple tapes to be added to a media pool. Fig. 7 - Adding multiple barcodes to a media pool. When using an autoloader in "sequential mode," the autoloader will appear to UltraBac as a stand-alone tape device. Before backing up, a tape must be put into the drive. If the autoloader is set to run in "sequential mode," all autoloader control functionality in UltraBac is disabled. NOTE: "Sequential mode" is a setting usually available through a configuration/control screen on the autoloader. Please refer to the manufacturer's documentation for more information on this setting. 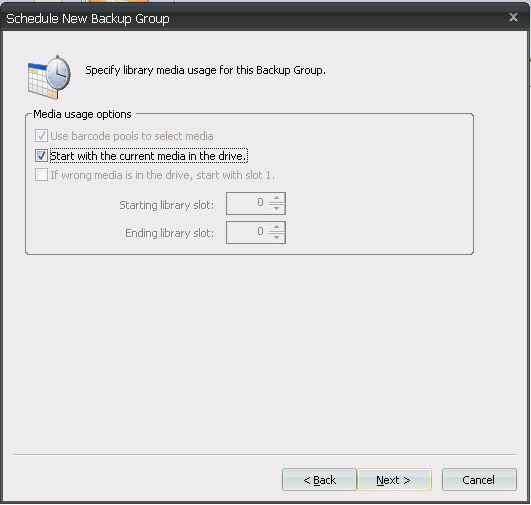 This option allows a range of autoloader slots to be specified for use in a scheduled backup group. If the amount of data backed up is larger than the capacity of the slot range, the backup will abort when it reaches the end of the tape. 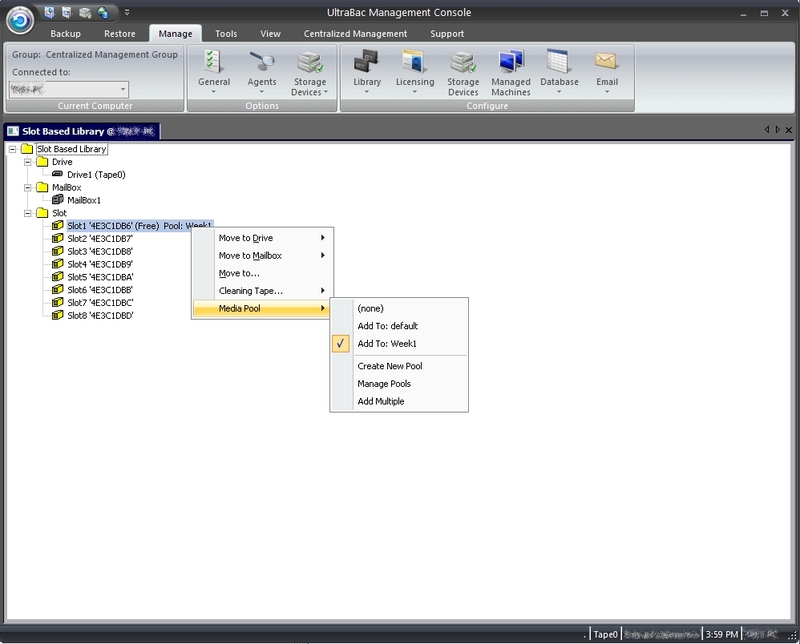 The slot range is specified during the creation of a scheduled group in the Scheduled Backup Wizard. NOTE: This setting will only be available if an autoloader tape device is specified as the first device to use, under "Use devices in this order," during a scheduled backup. Select the Tools tab, and click "View Events." Double click the backup job to be viewed. Fig. 8 - Library tab in the properties of a scheduled backup group. Media pools are assigned to each backup through the Scheduled Backup Wizard, or through the scheduled backup's properties. If the amount of data backed up exceeds the tape space provided in the media pool, a secondary, or spillover, media pool can be defined. NOTE: This setting will only be available if a media library tape device is specified as the device to use during backup. Failover support to a non-media pool device (BackupPath, stand-alone tape drive) is NOT supported. Select the Media Pools tab. Fig. 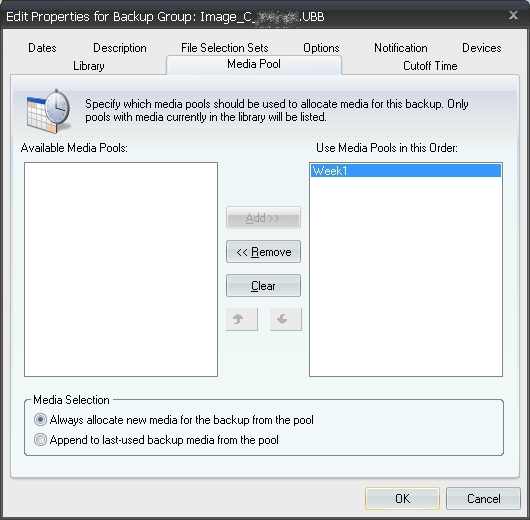 9 - Media Pool tab in the properties of a scheduled backup group. UltraBac will use the blank media in the pool first, then the expired media, protecting the media for five days (the default setting defined in the Manage tab, under "General"/"Media"). During the protection period, UltraBac will not be able to overwrite the tapes. When the protection period has ended, the media will appear as "expired" in the library controls, making the media available for backup rotation. If the protection period has been disabled, UltraBac protects the barcode media automatically for one day. Always allocate new media for the backup from the pool – Use the first expired tape in the pool when starting the backup. Append to last-used backup media from the pool – Append the backup to the most recently used tape in the media pool. NOTE: Ad hoc backups cannot use protected media pool tapes, and "Clear storage media" is disabled to eliminate the possibility of overwriting data. UltraBac has the ability to automatically schedule a cleaning operation on a cleaning tape in a barcode enabled library. Select the Manage tab, and click "Library"/"Autoclean Library." Right click on the slot containing the cleaning tape. Fig. 10 - Specifying a cleaning tape. Select "Cleaning Tape" from the menu options. Fig. 11 - Setting the AutoClean options. Specify the number of days between cleanings as recommended by the manufacturer of the library. Specify the maximum number of times the cleaning tape should be used as recommended by the manufacturer of the cleaning media.